Hi, my name is Rachel Degutz and today is May 15, 2011, today is also the 11th of Iyar 5771 in the Jewish calendar. 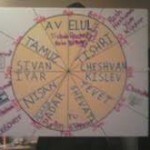 For my graduation project, I chose to learn all about the Jewish calendar. It is a combination of Jewish history, holidays and astronomy, which I am all fond of. In my speech I hope to answer all of your questions. Some of my questions were, What is the purpose of this calendar? Who uses this calendar? What exactly is the new year? How does the calendar relate to the moon phases? What does the year 5771 mean? And of course, when is my birthday? I found it really interesting to research and learn new facts all about the Jewish calendar. I hope that you also find my speech interesting. There are lots of interesting things you will know once you learn about the Jewish Calendar. For example, Does anybody know what Jewish month we are in right now? (If someone answers: Congratulations, that is correct.......If no one answers: Well know one knows, I stated at the begging of my speech. We are in the month of Iyar.) Another question, does anybody know what month can occur twice a year? (If someone answers: good, that was right, you will learn more about that later.......(If no one answers: That's okay because if you listen up you will soon find out.) Does anyone know when the start to the year is?........ Anyway, I shall get back to my speech now. To my left (or right), there is a chart that I made which shows the different months, important holidays, and the corresponding months in the Gregorian calender.The Jewish calender tells us many important things in each little square. This is an example of what a square on the calendar may look like. We consult the calendar to find out when to light the candles at sundown. Another reason people use this calendar is to know exactly when to light the yaahrzeitcandle in memory of a relatives' death. If you want to know what torah portion is being read on a particular Sabbath, you consult the calendar.Finally, it reminds us when the anniversaries of Jewish holidays and important events take place. As you can see, the Jewish calendar is necessary to keep us on track in our daily lives. This calendar plays an important role in uniting Jews all over the world. You may wonder when the Jewish new year is, well I certainly did. I recently found out that there are two starts to the year. There is a new start in Tishri and Nissan. Rosh Hashana, which means head of the year takes place in the month of Tishri. On Rosh Hashana people reflect on their past year and set goals on being a better person for the new year. 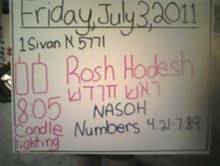 In Tishri you change the number of the year. In addition, the calendar starts over in the seventh month and ends in the sixth. 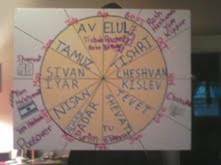 It starts over in Tishri and ends in the month of Elul. We say this because we want the year to start off with freedom.As you may know, Passover starts on the 15th day of Nissan and ends on the 21st or 22nd day of Nissan. In the Passover story, the Jews were enslaved by the Egyptians in the beginning,but in the end, they acquire freedom. Thus Nissan, the month of freedom is seen as the begging of the year. I hope that I made it clear to you about the two Jewish new years. A long, long time ago in a far away land, before 586 B.C.E. in the time of the first temple there was a land that we call Israel. In this land there was a king who appointed a group of responsible assistant for a very important job. This group was called Sanhedrin. The judges or Rabiiswithin this group would look up at the sky and wait until they saw a new moon. A new moon is a bright silvery crescent. This crescent faces the same way as a backward C.
This is a moon phase chart.These are drawings of the moon in different phases. Once they saw a new moon, they would sound there shofars to announce the new month to the community. This would be known as the holiday, Rosh Hodesh. Rosh Hodeshmeans the Head of the Month. It is a holiday that takes place on the first day of every month. The Sanhedrin would also sound his shofar to announce the beginning of Holy Days. But what if you lived really far away such as Persia, Rome or Egypt and couldn't hear the shofar? They made a bonfire on top of the mountain, so when the community on the next mountain saw it, they made their own bonfire and the chain began from mountain top to mountain top. You may wonder why the year is 5,771. Religious Jews believe that the world was created by God that many years ago. Jewish historians studied details in the torah. 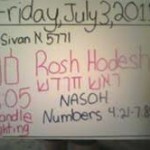 For example, they added up the ages of the people throughout the stories in the torah. They eventually came up with the number 5,771.
around the same time of year, but are rarely on the same exact date for each year. As you can see the Jewish calendar has some similarities and differences to the Gregorian calendar. Therefore the Jewish calendar is a combination of the solar and lunar cycles. The topic of the Jewish calendar piqued my curiosity. I choose to study the Jewish calendar because I was interested with the subject. One day I was thinking about Hanukkah and asked myself the question, why is it always around December but is rarely on the same dates?Once I asked my Father that question he suggested that I may want to do my graduation topic on the Jewish calendar. On the first day of a new month in the Jewish year, I always do the same thing. Walking outside, I look up and see a bright silvery crescent. 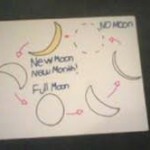 When I look at the new moon I soon become filled with the feeling of satisfaction and pride. 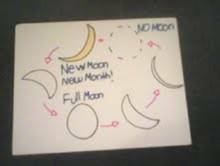 I feel satisfaction and pride because I actually know what the new moon is and how it relates to the Jewish calendar. It always feels nice to have a lot of background information about important topics. The Jewish calendar is a complex reference material, in which helps Jews all over the world. Thank you for listening to my speech. I hope that you all enjoy your newly obtained knowledge about the Jewish calendar.